Each profile card adds an effect to the planet that will come into play at some point during the game. 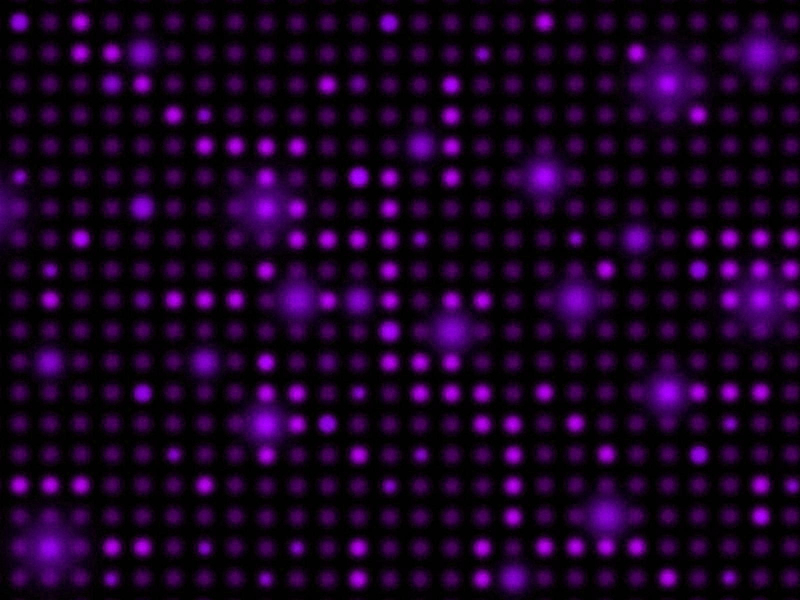 Like the original moons, planets with profiles generally must have a colony present for their effect to work; unlike moons, they do not automatically benefit whatever player occupies the planet. A few profiles do work this way, but most say "you" and "your" and thus work only for the owner of the system. You may reveal each of your profiles whenever you want to use its effect for the first time. It remains face up from that point on, and may be re-used unless the text says otherwise. You are not required to reveal any of your profiles unless specifically instructed to do so. A few profile cards allow or require ships to be placed directly on them. These ships are considered to be in that planetary system and are "at" a particular planet, but they do not constitute a colony on the planet unless the profile card specifically says they do. Moving/losing these ships will follow the same rules as for ships researching a tech card (when FFG clarifies how that works). If a new planet enters the game under the control of a particular player, give it a random profile card. If a planet leaves the game, discard its profile card (any ships directly on that profile card are sent to the warp). Profiles are not discarded, added to, or replaced except as indicated on the cards themselves. I have over 50 profiles currently in development, and hope to post most or all of them when they're ready for feedback. In the meantime, here are just a few examples (from simple to ridiculous). Remember that when these cards say "you" and "your", they are always speaking to the player who owns the system. Hyperfertility - Environment - Each player who has a colony here may retrieve an extra ship from the warp during his own regroup phase, placing it on this planet. If you do not have a colony here, when you retrieve your normal ship from the warp during your regroup phase, you may place it here (but may not use this profile to retrieve an extra ship this encounter). Exotic Pathogens - Biology - Whenever another player's destiny card with a Hazard symbol is drawn from the destiny deck, if that player has any ships on this planet you send one or two of them to the warp. Proximity Mines - Technology - Whenever another player gains a colony on this planet, his ships will hit mines unless he protects them by discarding non-encounter cards from his hand. He may land only as many ships on the planet as the number of non-encounter cards he discards; the remainder go to the warp. Elite Strike Force HQ - Facility - Whenever all of your ships in the hyperspace gate were taken from this planet, they are worth twice their normal value and earn double compensation and rewards (when appropriate). Global Famine - Biology - When there are two or more foreign colonies on this planet, they do not count toward winning the game only the one that has the least ships is "sustainable" and counts toward winning the game. If there is a tie for least ships, none of the foreign colonies here count toward winning. Politically Controlled Press - Politics - When there are two or more foreign colonies on this planet, only the one that has the most ships counts toward winning the game. If there is a tie for most ships, none of the foreign colonies here count toward winning. Hyper-Refractive Atmosphere - Environment - When the offense wins an encounter here, you must reveal one card from your hand if possible. If it is an encounter card, the offense has achieved victory over a mirage and all defensive ships survive the encounter (remaining on the planet or returning to other colonies as appropriate). You may discard the revealed card or return it to your hand. Deeds Immortalized in Song - Culture - Whenever another player gains a new colony on this planet (except as an ally), he must sing a little song about his success. If he refuses, his ships (plus those of his allies, if any) may not land here and must return to other colonies. 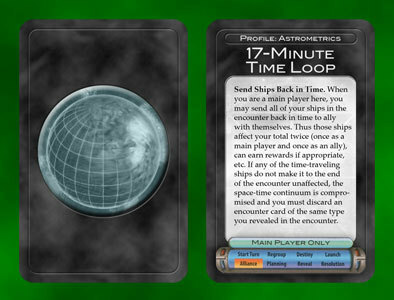 17-Minute Time Loop - Astrometrics (or maybe Anomaly) - When you are a main player here, you may send all of your ships in the encounter back in time to ally with themselves. Thus those ships affect your total twice (once as a main player and once as an ally), can earn rewards if appropriate, etc. If any of the time-traveling ships do not make it to the end of the encounter unaffected, the space-time continuum is compromised and you must discard an encounter card of the same type you revealed in the encounter.